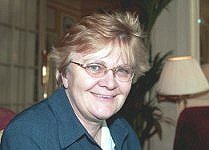 She will be remembered with warmth by many former colleagues from Sheffield, Sunderland, Middlesbrough and elsewhere, as well as members of the Association with whom she worked on the ADSS Older Persons Committee which she co-chaired with Christine Paley. ADASS President Sarah Pickup said that among her enormous contributions to the Association, her work on No Secrets, and All Our Tomorrows Inverting the Triangle of Care perhaps stand out as the most significant. ADASS extends its sympathy to all Glenyss of friends and family, she said. David Behan, Director General for Social care, Local Government and Care Partnerships at the DH said: I had a close relationship with Glenys she was my successor DSS for Middlesbrough Council and the excellent chair of the Associations Older Peoples Committee when I was president, where she led the work on the seminal All Our Tomorrows. I found her to be a supportive, stimulating colleague who helped me understand the role that social services could play in enhancing the wellbeing of older people. She was a woman of great intellect and integrity who inspired many to take a greater interest in older people. In later years she would often send me cards with suggestions for what I needed to do. Or provide words of encouragement and tell me to `keep going. She will be missed by many. Martin Manby, who worked with her between 1990 and 1997 said: Glenys had been battling against cancer for some years, with some good periods of remission; enjoying being part of an arts community in Lytham. She was very positive and philosophical, and surrounded by a lot of friends. She spoke very highly of the NHS health care she has received, and had been hoping that she would be able to enjoy a last summer this year. She was a hugely talented, focused, wise and very kind woman. Her brother, Tudor, would warmly like to invite any colleagues from ADSS/ADASS, to attend.